In the daytime, you can see the Sun in the sky and, at night, you can see the stars. But, if you go far up into outer space, you will NOT see the Sun and you will NOT see the stars! NASA keeps quiet about that little-known fact because, even today, scientists do not understand the nature of light. To them, ignorance is an embarrassment, so please don’t ask! However, new information has come to light, if you’ll excuse the pun. I now have answers that no scientist in the world has today. I speak to dead scientists! One of the great things about starting each day working with the guidance of an ascended master is that, once in a while, the master brings a surprise guest. One day, the spirit form of quantum physics pioneer Wolfgang Pauli showed up in my study! He’s quite a character and I immediately took a liking to him. He wanted me to know that, in the afterlife, science is not so mystified about quantum physics. In fact, what people call quantum weirdness is not, in fact, weird at all. However, it does take an expanded mindset to be able to grasp the spiritual underpinnings of physical reality. He says that physicists who insist that there is nothing beyond physical matter will never understand these things until they expand their worldview to at least include the metaphysical nature of light. Etheric energy is the key to understanding the nature of light. This vital life energy is a metaphysical, primary energy which, when stepped down and converted, becomes physical electric energy. Our physical bodies are made of matter which consists of electric energy. People in the realms of the afterlife inhabit spirit bodies which consist of etheric energy. Our eyes don’t see spirit people because physical eyes don’t see etheric energy or etheric matter. Cosmologists have detected the presence of huge amounts of etheric energy and matter in space but, because their eyes don’t see these things, they call them “dark energy” and “dark matter.” That’s rather ironic. Wolfgang assures me that, with spirit vision, etheric energy is not dark at all. Quite the opposite. To him, the air is filled with what looks like a sunlit mist because he sees that energy in the air. There is an etheric energy component to light. In its free-to-travel form, light is charged with etheric energy in addition to its well-known electric and magnetic energies. In fact, the nonphysical etheric energy encases and shrouds the physical electromagnetic energy from view. When a particle of light hits a barrier, or is deflected by an obstruction, it loses its etheric charge and become visible to physical human eyes. This happens because, when light hits a barrier and is forced to change course, its non-physical etheric energy component carries on as if no barrier had been encountered, much like a ghost passing through a physical wall. The physical (electromagnetic) component of the light, now diverted onto a different path and free of its nonphysical shroud, becomes visible. The Earth’s atmosphere diffracts (diverts) light, breaking it up to make the Sun appear yellow in a blue sky. 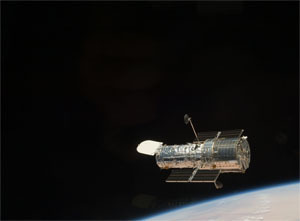 The lenses and mirrors in a space telescope such as the Hubble interfere with light, making it visible. You could see the stars through a window in a deep space craft provided the window includes a diffraction grating to interfere with the light. The Earth’s magnetosphere also interferes with light, making it visible, as detailed in my Dark Light Effect article. You can see light after it has reflected off an object. You can see also light after it collides with molecules of air in our atmosphere. But, if you travel up above the atmosphere and far into outer space, all the light from the Sun and the stars is traveling in an etherically charged, high energy state. That’s why you won’t see the stars. Their light is traveling in its metaphysically-enshrouded state. The good news is that, when you turn around, you’ll still see the Earth shining brightly, beckoning you home. Why? Because the sunlight that hits the earth’s atmosphere loses its metaphysical, etheric energy charge, dropping down to a physical energy level so that you can see its effects on the clouds and the ground. Etheric energy is the missing energy in today’s science. Until it is recognized and fully understood, it won’t establish its destined role in our growing understanding of the universe. As a primary energy, the science and applications of etheric energy will be magnitudes greater in importance than everything that has been achieved to date in electrical and electronic science. I haven’t even begun to release the information taught to me by more than one “dead” quantum physicist (they are actually very alive and living in the higher realms). If you are reading this article and you are not on our newsletter list, then sign up here, because this is where the really cool, paradigm-shifting info is about to launched upon an unsuspecting public! If you are on our newsletter list, go to any accounts you have with Facebook, Twitter, and Google Plus and Like Me (Hey, I’m not that bad! ), follow me, circle me, whatever. Then, the word has a chance to spread exponentially among the modern-day miracle that is social media. Get the word out. The New Reality will be what you create! This entry was posted in Metaphysical, Metaphysics, Spiritual Dynamics on March 1, 2014 by Owen K Waters. Owen K Waters transforms the mysteries of spiritual metaphysics into clarities. As an international spiritual teacher, he has helped hundreds of thousands of spiritual seekers to better understand the nature of their spiritual potential. For over fifty years, he has focused upon gaining spiritual insights through extensive research and the development of his inner vision. As co-founder of the Spiritual Dynamics Academy, he offers spiritual seekers a clear understanding and mastery of the spiritual principles of life.